Mommy and me…the hot mess edition! Mr. Serious has been in bed all weekend since his PRK LASIK surgery Friday. Because of the way it’s done, it’s expected to be painful for a couple days. So, you get me. 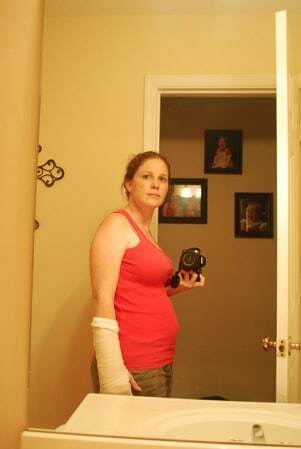 Splint on my arm (broken hand bone, thanks to the chase). Looking “a hot mess” (my previous students taught me this expression)….and not even able to smile. 15 weeks pregnant, so it’s still mommy and me, right? What’s the verdict on the neighbor? Will you guys ever know if they got in touch with him? And, most importantly, will he ever find out that you broke your dang HAND during all that?! they have been cited and have a court date. i still haven’t gone over and talked to them about medical bills, etc. I know you don’t feel it but your beautiful my friend. Just keep breathing and take one day at a time. This too shall pass…Blessings and Grace Dear Cuz! I love the phrase….”a hot mess.” My students taught me that too!! Oh you’re not a hot mess, considering everything, you look awesome! First things first-LOVE your baby belly! And I am so sorry about your injury 🙁 Here is to a much, much better week! Sorry about your hand. Hope it heals soon. Hey, I just noticed something. You’ve got a pic of you and your belly but there are also pics of children in the background. I’m assuming they are yours, I could be wrong. But see, the belly counts and the pics in the background for mommy and me. you are right…the one on the top is actually me, and the bottom is my oldest. I am sorry that you broke your hand….your right hand no less… believe me I know that broken bones are no fun. I hope that you will heal quickly. I hope that Mr. Serious is healing well too. In spite of all this I am happy that your pregnancy is going well. Yikes about the hand friend! Were you able to get the xray? And you don’t look like a hot mess…you look definitely look cute pregnant! no x-ray…just went off how it felt. You and your poor arm!!! that is crazy! hope you feel better soon. My neighbor’s hubs had that same surgery done and it was painful but then it clears up quickly and he has been seeing great since! I guess I haven’t been following lately…..didnt catch the blog post on the pregnancy, congrats!!!! I need to contact you again for a blog design. This time, I want a minimalist design, ha 🙂 Happy Mommy and Me Monday! Oh geez, I’d probably be holding back a smile too. You’ve had a rough go of it lately. I’d hardly call this picture “hot mess” worthy, though the cast does make me sad! Hope you and your hubby are both feeling better and less painful soon! And yes, bambino definitely makes this qualify as mommy & me! Oh my gosh!!! I didn’t know you broke your hand! Cripes! Horrid dog. I think you look adorable! Seriously. Look at that tiny baby belly! And if that is you looking like a hot mess than I am JEALOUS! After that chase last week I don’t blame you for feeling like a hot mess…I however think you & your bump look great! Perfect Mommy & Me edition for you & this new little one! for the record it is impossible for a pregnant woman to be a hot mess. pregnancy = beauty. no matter what!! although you do look like a bad a** with that arm thing!! You look great! I love your link up. I ll try to post something on Monday and link up!